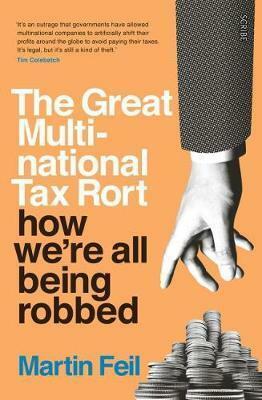 Multinational corporations have avoided trillions of dollars of tax over the past 25 years. Tax avoidance is legal, but its massive abuse by multinationals has had a devastating effect on governments around the world, and has placed an unbearable burden on individual taxpayers and on honest local competitors. Multinational corporations generate profits in around 180 countries around the world. They work hard to avoid, reduce, or delay their tax obligations for as long as possible, and they generally succeed. Sometimes they pay nothing or, at best, the percentage of their multibillion-dollar incomes that they pay in tax is a lot less than the percentage an individual worker pays. Four accounting firms - Pricewaterhouse Coopers, Ernst & Young, KPMG, and Deloitte - are the global accountants and tax advisers for the multinationals. They have been paid over $500 billion in the past 25 years to prepare annual accounts and to manage the multinationals' tax affairs. The favourite tool of the 'Big Four' accountancies to minimise tax for their multinational clients is transfer pricing- a complex and confusing array of methodologies and strategies that works to reduce tax or even avoid tax payments altogether. The Great Multinational Tax Rort explains how transfer pricing developed, and describes the strategies and tactics that the Big Four global accounting firms use on behalf of their voracious clients. Written by Martin Feil, one of the few independent experts on transfer pricing and profit repatriation by multinationals - a former poacher turned gamekeeper - this is a call to arms for citizens and governments to restore a fair taxation system. Martin Feil was born in 1947, and became the Industries Commission's youngest project director at the age of 26. He was eventually responsible for 11 major industry inquiries, before working as an industry-policy consultant for the next 30 years. During that time he also owned trucks, warehouses, Customs bonds-stores, and container yards, and worked for the Australian Taxation Office as one of the few Australian independent experts on transfer pricing and profit repatriation by multinationals. He has been chairman of the Institute of Chartered Accountants' customs committee, and the institute's representative on the tax offices transfer-pricing subcommittee.